His name is David French. He is not from France. However, he is from Scotland. I guess I can settle with that, at least he is from some European country. Of course none of this matters, as his music is excellent no matter where he hails from. 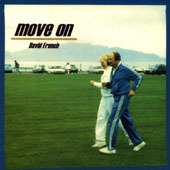 Move On is David's first release - it is not an album, but instead a CD Maxi-Single containing 3 songs. All three of which are excellent. The instrumentation is a superb blend of voilin, cello, drums, bass, and electric guitar. I would have been pleased to hear an album of pure instrumentation if it constisted of music of this quality. However, this little CD also contains vocals on all three tracks - making the cd even more worth listening to. The lyrics are thought-provoking, and the way in which he construes them just absorbs the listener. I had a few people listen to this, and each of them was immediately pleased. Some even noted that as soon as the vocals kicked in they liked it. Mr. French should be more than pleased with the way this Maxi-Single turned out. I sure as hell am. Sadly, I cannot give it an "out of five" rating, since it is only three songs, but let's just say that if I were graced with an entire album of this quality, I would be handing out at least a 4 out of 5. My congratulations to David.